With the fast-food industry under attack from the rapidly-changing tastes of consumers, it had to innovate or continue to lose business in a post-Fast Food Nation world. 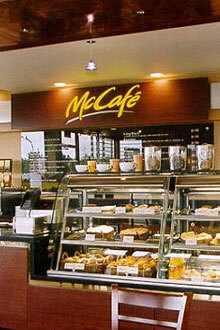 McDonald’s kicked it up a notch with the McCafe. With affordable fancy(ish) coffee, dessert and walls of glamorous photos of glamorous people having a good time, it’s sort of like a Starbucks for people who like the smell of melted cheese and french-fry grease. While McDonald’s may already have cornered the market in semi-classy-coffee- at-a-burger-joint, other fast-food places could still rebrand and offer something more than burgers and fries. All they have to do is keep an eye on the pulse of the masses. They’re making everything into sisig now, anyway. From the original recipe of chopped-up pig cheeks, we now have tuna sisig, chicken sisig, bangus sisig, sisig pizza. Hell, there’d be a salad sisig if someone can figure out how to keep lettuce crisp while floating in grease. They already have more oil than a small African nation, and all the excess chicken parts they need. All KFC has to do is retool the Colonel to look like that fat, sweaty guy who chops up the meat and throws them on the hot plate. Since Wendy’s is open all night, anyway, just dimming the lights and getting a DJ will turn it into the most happening night spot along Commonwealth Avenue and other remote locations. Stainless steel counter tops make a wonderful surface to snort cocaine off of, and their Biggie cups can serve as cocktail glasses and something to vomit in when having a bad trip. The fucked-up spelling also makes it sound like a cool, happening place to be instead of a burger restaurant named after some kid in pigtails. Jollibee has consistently beaten McDonald’s in several categories from share of the fried chicken market to Not Having a Mascot that Makes People Go “WTF?” Now, Jollibee will trump the pantywaist McCafe by serving something that Filipinos love more than glorified coffee: motherfucking alcohol. Considering how often kids bug their parents to eat at Jollibee, after Sunday mass, say, it’s practically a public service. With the kid happily playing with his Kid’s Meal toy, and the dad pleasantly drunk, everybody wins. hahaha, tang ena, laugh trip. I don’t get the title though. Care to explain? Yeah. Mikonawa asked me about that, too. more descriptive titles next time. It’s the punchline to an old Alma Moreno joke. It was probably good for a laugh in the 80s. I shall try to fix it, or make it worse. Ha, you’re old 😛 Good joke though. hi onetamad. i finally succumb to your suggestion that i visit this site. your ^_^ is a giveaway. Thanks for dropping by, lakandiwa. @jester: Dine in affords you a shot at a bar fight with The Bee. Because nothing says hit me quite like a goofy, over-sized insect.